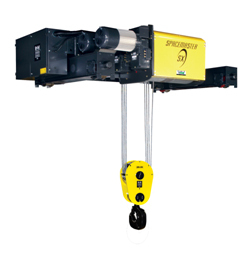 The Spacemaster SX Low Headroom Hoist represents a revolutionary new generation of exceptionally reliable electric wire rope hoists, featuring advanced technology and cutting-edge performance. An innovative design that includes a large drum diameter gives Spacemaster SX hoists the lowest headroom and best wheel loads in the industry while providing near true vertical lift with single reeved hoists, and both exceptional hook approaches and heights of lift. Large-diameter wire rope hoist drum means easy positioning, closer approaches. R&M's larger drum diameter provides near true vertical lift with a single reeved hoist - only 1/8" drift per foot of lift. The result is exceptionally smooth movement and fast load positioning. This innovative design also means a shorter frame length, allowing closer end approaches. R&M Hoist and trolley motors designed for space savings and productivity. Standard two-speed hoist motor (6:1 ratio), designed specifically for hoisting applications, offers high starting torque and ensures precise and reliable load handling. The RM Spacemaster hoist motor is class F insulated, 30 minute rated (60% effective duty), thermally protected and totally enclosed. minimal load swing, fast, efficient handling and accurate load placement. Standard safety features that competitors don't offer or offer at extra cost. 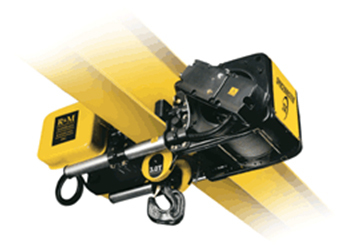 All R&M SX Wire Rope Hoists are equipped with electro-mechanical load limit switch prevents the lifting of loads that are in excess of 110% of rated capacity. The 4-position hoist limit switch includes an innovative phase mismatch protection circuit that prevents the block from running up and damaging the hoist in the event of phase reversal. the hoist's safe operation and increased reliability. Sealed brakes mean long-term value. Sealed dust-proof brakes on the trolley and hoist motors require little adjustment for over a million cycles and will last the life of the hoist under normal use. The trolley drive is totally enclosed, grease lubricated and is designed to be maintenance-free. Trolley wheel bearings are permanently lubricated. The automatic disc brake and inverter control help extend the life of the motor and other components, which means less maintenance, less downtime, lower repair costs and reduced cost over the lifetime of your hoist equipment. Innovative gearbox provides dependable operation and extends equipment life. to extend its working life. The gear case is designed to run cooler and more efficiently than those equipped with a mechanical load brake. Larger hoist drum minimizes rope wear and enhances cooling. A drum/rope diameter ratio of approximately 40:1 minimizes rope flex, reducing wear and extending rope life. The drum's large diameter also contributes to a reduction in frame size and weight, reducing wear on hoist components and enabling the use of more cost-effective crane girders. The unique placement of the hoist motor inside the drum provides directed airflow through the drum for optimal motor cooling. This design also makes the motor and brake more easily accessible. 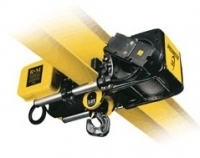 Superior clearance and headroom for double girder crane applications. track applications are also available.